My Whispers of Aloha have been heard from the uplands to the sea ~ on Twitter, Facebook and Squidoo. Aloha means much more than Hello and Goodbye. "Aloha means compassion for all the things on earth" (Serge King). It suggests love and much, much more. As an Artist of the Spirit, I create art as a contemplative and spiritual practice. 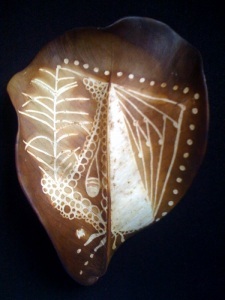 My practice is called HUNArt ~ a combination of the Hawaiian philosophy of Huna and art as a moving meditation. I will be combining my Whispers of Aloha (my daily prayers as one of my friends calls them) with Zentangle®, an intuitive artform created by Rick Roberts and Maria Thomas. Taking inspiration from Duane Keiser who created A Painting a Day ~ I will be creating a Zentangle inspired Art~a~Day. These leaves will then be made available for purchase from our online store. Journey with me as Earl and I wake up each morning to take a walk to a place in front of our house, where the ocean crashes upon the dark lava stone shore. On my walk I will find a leaf from the autograph tree found in Hawaii. I will greet Laka, the goddess of hula and of plants and with a chant, thank her for this gift from nature. 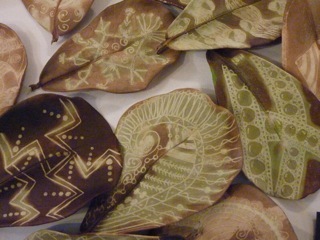 When I return home I will continue this meditation by etching the leaf with a bamboo knitting needle. 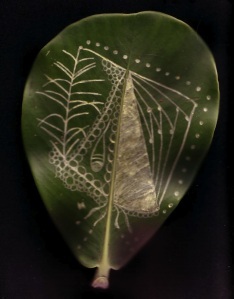 I will be asking for inspiration for a Whisper of Aloha as I create tangles or patterns on the leaf in Zentangle style. I will then breathe in the beauty of this symbol and send it out around the world. I am creating Zentangle inspired Art~a~Day because I felt a need to create a new pattern in my life. I wanted to establish a ritual or a habit if you will ~ of walking to the ocean at sunrise ~ creating art ~ and Whispering Aloha. Below is an example of how a green leaf turns golden brown after a week. By the way, dried leaves are no problem to agricultural inspection and are approved for direct shipping.